The cCar team set out on the road for Michigan International Speedway, 39 hours and roughly 2,400 miles from Corvallis, Oregon to Brooklyn, Michigan. We were one of 120 teams here to compete for the overall prize, all of these schools aiming to score 1,000 points throughout the week. GFR has taken first place 6 of the last 7 years here in Michigan! Wednesday morning kicked off the full first day of competition, and our goal was to get through tech inspection, but it didn’t go as smoothly as we would’ve liked. Officials told us the roll hoop mounting to the chassis wasn’t strong enough, meaning if the car rolled they didn’t believe the system could support the driver in an accident. We managed to get it done and reassemble the car just in time before 7pm that evening to re-tech the car and get approval to drive. We avoided a major setback getting that done before Thursday. Thursday was full of what we call the static events; design, cost, and business presentation. 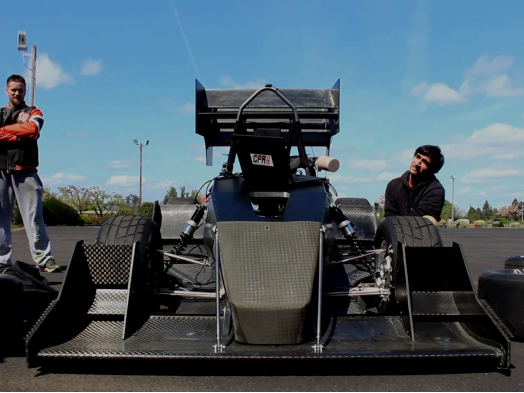 In each of these events, team members have to defend the car’s design and performance in many different ways. Ultimately we have to prove to the judges that we’ve properly tested and collected data on our car to back up our performance claims. The business presentation went almost flawlessly, but still placed 10th. Cost placed 98th and design tied for 12th. On Thursday our paddock also played host to three-time Sprint Cup Champion Tony Stewart! 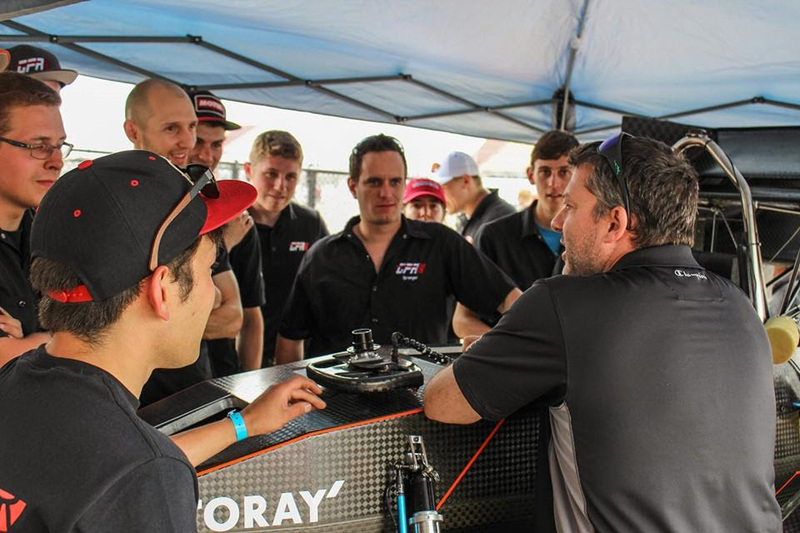 Yes, the NASCAR legend himself stopped by to chat with our team while we made some finishing touches to our car. Lots of racing was discussed before the champ had to catch his plane to Dover for his next race, and before we had to go out on track for our events the following day! Friday and Saturday are the dynamic days, where we’re on track in the four dynamic events; skidpad, acceleration, autocross and endurance. Skidpad went perfectly and we had the fastest time right until the closing minutes where we were beat by a fraction of a second and were bumped back to finishing in 2nd place. Acceleration is always tough for us and we finished 16th, as our design philosophy limits us on doing well in this event, but enables us to exceed in the most point sensitive events like autocross and endurance. As for autocross and endurance, we were fast but couldn’t take the top spot in either event. Our second driver wasn’t given a second run in Autocross due to the event closing for the day and Endurance was run in “damp” track conditions. We took a podium in Autocross by placing 3rd and came home 7th in Endurance. To win a competition things have to go perfect, and that didn’t occur for us this week but in the end we brought home a fourth place overall! 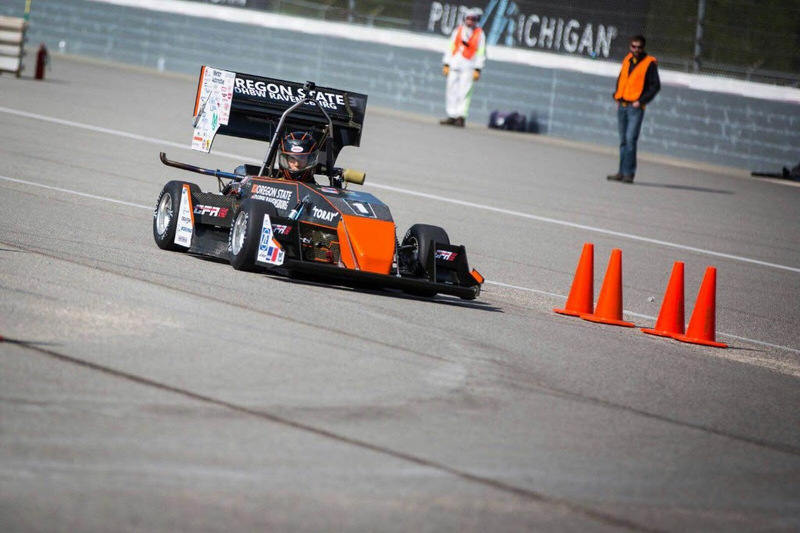 We would like to congratulate the winners of FSAE Michigan 2016, the “Rennteam Stuttgart”! The team is looking forward to Europe now to keep our European winning streak alive!